A La Nanita Nana New for TB! This hauntingly beautiful arrangement of the Traditional Spanish carol features the gentle feel of a lullaby and an interesting mixture of major and minor modes. Both Spanish and English lyrics are used, and a pronunciation guide is included. Now available in multiple voicings; suitable for school or church use. Originally published in Ruthie's musical, "It's Christmas Everywhere." African Lullaby is a tender, timeless song based on the Ugandan Lullaby, "Mwana Wange," it paints a touching and gentle picture of the intimacy of the nativity. The optional gentle drum parts (included in the score) will enhance the mood of the quiet manger scene. Available in two voicings, suitable for school or church use. Lovely setting of the beloved Korean folk song about the mountain pass of Ahrirang Hill. Sung predominantly in English, the pentatonic melodies and open harmonies are presented in unison and canon to appropriately convey the style of the song and the depiction of the text. Ahrirang is often believed to be a symbol of peace, contentment, and personal triumph. This makes a wonderful selection to teach the context and style of music from that region. This vibrantly rhythmic and percussive setting of the traditional Spanish tune is all decked out with a new English text and is absolutely infectious. The original Spanish is offered as a performance option, along with a pronunciation guide and translation, although the piece may be performed entirely in English. Percussion parts for tambourine, triangle, finger cymbals, jingle bells and wood block are included which will add a festive flair to this exciting multicultural creative programming gem. A wonderful resource of the new Sing! catalog (Educational division of Choristers Guild) is the inclusion of a Learning Resource Page (included in this piece, inside the front cover). These provide students with focus questions and suggested learning experiences to become engaged with the work and the newly developed National Core Arts Standards for Music Ensembles (2014). The familiar African-American Spiritual has been expressively arranged in multiple voicings by Ruth Elaine Schram. It starts out in A minor with open, parallel fifths in the piano part then moves into C-major when the voices come in, and the ending just fades away, again in A minor. Suitable for school or church use. This gorgeous arrangement of the Welsh folk song is a perfect choice for the Christmas season or any time. Easily learned; suitable for children's voices or ladies voices. The SSA version of this song was a number one seller and this arrangement was adapted for use in the HBO television series, "The Sopranos". Also available in the "Rise Up and Sing!" SSA concert collection. In the style of a tender lullaby, Ruth Elaine Schram intertwines "All Through the Night;" "Silent Night, Holy Night;" and "Still, Still, Still" to create a musical blanket of peace. Accessible and effective, this lyrical gem will highlight the musicality of your women's choir. Suitable for church or school use. The delightful, popular Spiritual is available with an all-Christmas text, in a truly choral arrangement. After the chorus is sung, the first verse begins "See the tiny baby lyin' in the manger on Christmas morning!" and continues with the shepherds running to greet him in the lowly stable, the kings and wise men kneeling down before him, and the angels singing "Amen, Hallelujah, Amen!" Powerful and fun, yet not difficult to prepare. Suitable for school or church use. Free MP3 part-by-part rehearsal aids and accompaniments are available from the publisher. Collection of ten American Folk Songs arranged for duets. Includes arrangements by Ruth Elaine Schram, Mark Hayes, Jay Althouse, David Waggoner, and Andy Beck. Equally suitable for school or church use, this delightful melding of three spirituals allows opportunities for young, developing choirs to create beautiful tone quality while preparing for an artistic performance. Beginning with "All Night, All Day," the song glides into "In the morning, when I rise ..." and concludes with "Every night when the sun goes in ... Angels watching over me...." For mixed or treble voices. The soaring Welsh folk tune is surrounded by a flowing piano accompaniment and imitative counterlines in this delightfully sensitive setting. With rich, easily singable harmonies, this will make any choir sound wonderful. This rocking, soothing SSA setting of Away in a Manger by Ruth Elaine Schram is easy to learn and multi-functional. Ruthie has provided the option of using the holiday text or that of Robert Burns' well known poem "Flow Gently, Sweet Afton" making it an excellent addition to your holiday or festival program. Suitable for school or church use. This beautiful Scottish lullaby is appropriate for seasonal or general use, Festivals or Concerts. The text is in English with Gaelic subtext, along with an accessible pronunciation guide. The vowels of the text lend themselves to teaching beautiful tone. Flexibly voiced for Three-part Mixed voices with an optional Baritone part, or SSA voices. Lovely, lyrical, and simply beautiful arrangement by Ruthie Schram. Bright, happy, dance-like arrangement of the Jamaican Folk Song features stomps, claps, and a tasty, articulated accompaniment which provides additional percussive interest. The song gradually builds from lots of unison to harmony with the use of echo and descant, then softens down to "pp" at the end as the dancers "fade away" into the distance. Fun! This beautiful American folk melody has been given a gorgeous new setting for mixed or men's voices. This gem will be a popular choice for concert and festival performances for years to come. This is fun! Your audience will chuckle out loud when they hear this delightful folk song about the bug that took over Texas! A singable melody, simple harmonies and humorous lyrics tell the story, and the addition of easy body percussion or choreography will make it come alive visually as well. It's a real charmer and crowd-pleaser, suitable any time of the year or as a novelty piece in your Spring concert. Authentic folk songs from around the world are especially arranged for beginning Two Part voices. Compiled and edited by Andy Beck and Brian Fisher, accompaniments orchestrated by Tim Hayden. Fun fact pages provide a fascinating look at cultures of nine countries on four continents, as well as doubling as an optional narration for a 30 minute program. Includes Ruthie Schram's gorgeous arrangement of the lovely Welsh lullaby, Suo Gan. Handbook is 100% Reproducible for your convenience. Imaginative arrangement of the traditional favorite. This bright, crisp setting is very easy to sing yet sounds impressive when sung by even the youngest of choirs. Suitable for church or school use. This collection, designed specifically for the capabilities of the developing voice, features a variety of creative Solo arrangements of carols from around the world by Ruth Elaine Schram. These solos may be performed individually or as a complete Christmas recital for school or church use. The collection is available for the Medium High or the Medium Low voice. Professionally recorded Piano Accompaniment tracks are available FREE from the Lorenz web site. Visit www.lorenz.com and search for 30/3137H (Medium High voicing) or 30/3138H (Medium Low voicing). Click on the free download link, and download the appropriate MP3. Songs include: A la Nanita Nana; All Through the Still, Silent Night; El Rorro; Fa La La Noel; Follow the Christmas Star; Go, Tell It! He is Born; Sing Noel; and What Child Is This? Delightful, authentic arrangement of this well-known Mexican folk song moves quickly! This arrangement features both Spanish and English texts; pronunciation given. The English is a direct translation from the Spanish. The piano accompaniment captures the sound of Flamenco Guitars and Mariachi trumpets. Available in two voicings for developing choirs. "Come Thou Fount" is one of the great songs of sacred literature. The soaring melody and expressive texts are powerfully set by Ruth Elaine Schram, capturing the strength and beauty of this exceptional work. Suitable for church or school use. Gentle arrangement of the beautiful "Londonderry Air" for young voices. Full of opportunities for teaching legato singing, expression and dynamics, and breath support. The upbeat swing style of this classic African American Spiritual arranged by Ruth Elaine Schram is ideal for any concert, and suitable for church or school use. Optional Guitar, Bass, and Drum parts are included in the score. This lovely pentatonic Korean folk song is framed with gentle harmonies and a free-flowing melody. Lyrics in both Korean and English are sure to capture the hearts and minds of your singers and audience. A refreshing addition to any concert program! A pronunciation guide is included. The wonderful African-American Spiritual has been given a powerful, upbeat treatment in this fresh arrangement by Ruth Elaine Schram. Available in multiple voicings, along with a compelling Accompaniment track. The well-known spiritual has been arranged for voices of all ages, with the familiar ascending chromatic key changes in the first section and the descending modulations in the latter section. Optional guitar, bass and drum parts are included in the score; suitable for church or school use. In this attractive arrangement, Ruth Elaine Schram gives a lovely but lesser-known Mexican lullaby a tender treatment for treble voices. Delightfully simple to sing and featuring delicate dynamic changes, this carol that is appropriate for both school and church settings includes performance options for the original Spanish text, Ruthie's English translation, or a combination of the two. A pronunciation guide for the Spanish lyrics is included. Take your singers on a ride on the Erie Canal, one of America's time-honored folk songs! Ruthie Schram's rhythmically interesting arrangement is full of syncopations and will develop excellent diction in young singers. If it suits the needs and abilities of the ensemble, the optional second part provides an opportunity to teach and hear descant-style harmony. Also available for solo male voice in Ruthie's "Traveling On" collection (BLB003). Beautiful, legato arrangement of the African American spiritual is suitable for school or church use, and appropriate for contests and festivals. Only moderately difficult, available in three voicings. Inventive, rhythmic arrangement of the African-American spiritual. Both youth and adult choirs will enjoy this one! Suitable for church or school choirs. An accompaniment track is available; optional guitar, bass, and drum parts are included. Delightful arrangement of the Nigerian folk song, sung in four languages (pronunciation guide given). Your students will learn Nigerian, Chinese, and French translations of this phrase! Optional Orff percussion is included, and an accompaniment track is available. "A la Media Noche;" "Deck the Hall;" and "Noel Nouvelet" represent three nationalities in this bright medley. With a quick-moving pace and pulse in two, the first "fa la la" establishes the festive mood. This work intriguingly mixes major and minor modes to keep your choir on their toes and the listener engaged! For treble or mixed voices; Performance / Accompaniment CD available singly or on the compilation CD. Ruth Elaine Schram's arrangement of the beautiful folk song is gentle and flowing, while evoking a sense of longing. Also known as "Nora's Dove," or "Sad Man Blues," this song with its roots in the African American Spiritual expresses a search for freedom, a yearning to go home, a hopelessness that builds to the hope found in "spreading your wings." Suitable any time during the school year. This lovely adaptation of an African Folk Song is hauntingly beautiful and yet accessible for young singers. An optional Flute obbligato and Orff accompaniment (included in score) adds to the beauty of the piece and helps the work build throughout, only to come back to a soft climax that will leave your audience breathless. The portion from Measure 25 to the end would make a beautiful, memorable encore at the end of your concert and a fitting closer. The chorus also appears in canon, making this piece easy to learn and express. Fun musical revue including a wide variety of favorite folk songs. Shorter sections may be performed individually. Fourteen favorite folk songs compiled by Jay Althouse, arranged for solo voice and piano by Ruth Elaine Schram, Jay Althouse and Mark Hayes. Based upon the traditional spiritual, "Follow the Drinking Gourd," this mesmerizing setting is full of calls and responses to "follow, follow" and is easily accessible and wonderfully crafted for school or church choirs. The light percussion adds a little something extra to this wonderfully crafted Christmas anthem, flexibly voiced for Two-part any combination of voices. Although this tune is often associated with up-beat, rhythmic settings, Ruth Elaine Schram's a cappella arrangement offers a more thoughtful and poignant approach befitting the reverent text. Rich harmonies and well-crafted choral lines ensure a captivating presentation for Christmas worship or holiday concerts. Lovely arrangement of the American Folk Song, arranged in multiple voicings with beautiful, flowing piano accompaniment. Uplifting and lively, this new partner song arrangements pairs two of the most popular Christmas tunes, the traditional French carol, "He Is Born," with the traditional Spiritual, "Go Tell It On the Mountain." Crowned by an optional flute solo, equally suitable for school or church use. During the telling of this classic carol about a king who is generous to the poor during a harsh winter, Ruthie Schram mixes the use of soloists and word painting to help the audience experience the cold winds and the conversations between the good king and his loyal page. A wonderful holiday selection for your chorus. Two delightfully uplifting spirituals, "Good News" and "Swing Low, Sweet Chariot" are partnered in this swing-style, upbeat arrangement for Two-Part Any Combination voices (suggestions given for mixed voices). Expertly crafted for beginning part singers or small, volunteer choirs, it opens with one spiritual, introduces the second, then partners them in the final section. Equally useful in a school or church setting, "Good News!" is a toe tapping, fun choice for both concerts and worship services. Based on the premise that women "grumble too much," this upbeat arrangement of the Jamaican Folk Song features lots of fun, back-and-forth dialogue and interplay between the men and the ladies in the SATB edition, and the higher and lower voices in the TTB edition. Several small percussion patterns are included and may be employed throughout, and portions of the accompaniment are designed to sound like steel drums, lending an authentic Island feel for an effective performance. Beautiful North Carolina folk song arranged for ladies' voices. Supportive accompaniment is expressive and moving. This bright, upbeat pairing of the spirituals "I Ain't Gonna Grieve My Lord No More" and "I Got Shoes" features call and response and simple harmonies supported by a fun, rhythmic piano accompaniment. Especially effective as a concert or festival opener or closer, it is a superb programming choice for young and developing choirs. "Keep your hand on-a that plow..." An absorbing accompaniment and attractive chord structure support the vocal lines in this dynamic and powerful arrangement of the popular spiritual. It is a terrific choice for use at your next performance as an opening or closing number! Available for SATB (with some divisi) or SSAA voices. Combined with an additional original melody, Ruthie Schram offers this simply joyful and supremely easy art-song setting of the familiar carol for treble voices. Optional Flute part included in score is the perfect complement to this Partner song. Perhaps the world's most beloved carols, "Silent Night" and "O Holy Night" are masterfully combined in this powerful arrangement by Ruth Elaine Schram. The two classics shimmer with rich harmonies, and the addition of the optional string orchestra create a sense of wonder and awe. Fitting for worship services and pageants as well as seasonal concerts, this heartwarming choral captures the beauty and essence of the Christmas season. For mixed or ladies' voices. String orchestration includes reduction for Synth. Superb voice leading characterizes this SSA setting of the Traditional Quaker Hymn. A perfect choice for contests or festivals, this piece provides a wonderful opportunity for an aesthetic experience for your singers. Moderately difficult, this song uses echo, repetition, and modulation not only for a beautiful, interesting performance but to provide teaching opportunities for balance and blend. Your group will sound warm and sensitive on this flowing setting. This inventive arrangement of the traditional folk song has an alternate text for Christmas. "Hush, little baby, don't you cry, Mama's gonna sing you a lullaby. In that lullaby she sings, you'll hear the brush of angels' wings ..." With a gently rocking interlude to separate the verses and a few harmonic surprises, this is sweet and lovely all the way. From her collection "Every Day's a Holiday" (30/2477H), Ruth Elaine Schram offers this powerful partner song that celebrates our freedom and equality. The lyrical original melody pairs with the traditional "We Shall Overcome" in vocal parts that are accessible and easily learned. Sensitive and thoughtful, this selection is perfect for young and developing choirs and an obvious choice for Black History Month, Martin Luther King Day, or other patriotic celebrations. Beautifully orchestrated Accompaniment CD by Greg Gilpin is available as well. This fast-moving setting of the French Canadian folksong "J'entends le Moulin" is perfect for developing choirs. Optional percussion parts, English or French lyrics, and performance suggestions make this accessible work a delight to prepare and perform! Performance / Accompaniment CD available. Unique partner song for Mixed voices begins with the popular French carol set in a tender, deliberate tempo. The men begin the song, setting the stage for the angelic entrance of ladies voices singing "Gloria in Excelsis!" from Ruth Elaine Schram's original "He Is Born, Gloria!" English subtext is included with the traditional French for flexibility in performance. Unique partner song for SSA choirs begins with the popular French carol set in a tender, deliberate tempo. The altos begin the song, setting the stage for the angelic entrance of soprano voices singing "Gloria in Excelsis!" (from Ruth Elaine Schram's original "He Is Born, Gloria!"). English subtext is included with the traditional French for flexibility in programming this during the holidays. Suitable for school or church use. Incorporating the spirituals "Mary Had a Baby," "The Angel Band," "I'm Gonna Sing," and "Go, Tell It On the Mountain," Ruth Elaine Schram has tied them together with original words and music for a fun, upbeat medley. This bright swing-style piece will be a unique change of pace for the holidays. Suitable for church or school use (with alternate text included), available in multiple voicings. Ruth Elaine Schram has created a gorgeous melding of the beloved carols "Infant Holy, Infant Lowly" and "Silent Night" in a gentle arrangement that is equally suited for both school and church use. A subtle programming contrast, it will bring moments of beauty and reflection to any performance. Available for SATB, SSA, or Two-part Choirs. Combining a plaintive Irish carol tune with an emotional text by Charlotte Lee, Ruth Elaine Schram portrays the true spirit of the season with rich imagery of a magical winter night. "No strangers walk this pathway, but friends both great and good, who find a kindly welcome at the inn by the edge of the wood." Optional oboe and cello parts are available as a free download from the Lorenz website. Visit www.lorenz.com and search for 15/3240H. Accompaniment CD is also available separately. It's So Still in Bethlehem New! This tender pairing of two beloved carols ("Still, Still, Still" and "O Little Town of Bethlehem") features a flowing piano accompaniment with optional use of handchimes. Gentle melodies and harmonies that tie the two carols together add beauty, depth and character. Available in a variety of voicings to meet the needs of most any ensemble, it makes a wonderful Christmas selection in both school and church settings. This rhythmic Tanzanian Folk Song ("Jibuli" is Tanzanian for rabbit) is absolutely terrific for young choirs just beginning part-singing. Featuring echo passages and a descant-like section, it is extremely accessible and ensures built-in success. Optional conga parts are included in the score and add a colorful flair. Winning mixture of "Joy to the World" and "He's Got the Whole World In His Hands," suitable for church or school use. The song starts off in 4/4 with a bit of a swing, but for the third verse ("He's got the tiny baby...") it slows to 3/4 and goes to even eighths, while the accompaniment plays portions of "Brahm's Lullaby" and "Rock-a-bye Baby." The tempo picks back up for the fourth verse and a strong ending. The accompaniment CD is orchestrated by Steve Herold. The beloved campfire song has been artfully arranged for Unison / Optional Two Part voices. The familiar melody has been given beautiful fresh harmonies that a new generation will cherish. Traditional Latin text set to music based upon Movement II, "Largo," from Symphony No. 9, Opus 95, "From the New World" by Antonin Dvorak, arranged by Ruth Elaine Schram. This well-known melody is also known as the Spiritual "Goin' Home." Optional oboe or other C-instrument part is included. Let My People Go New! The pairing of these two traditional Spirituals ("Deep River" and "Go Down, Moses") was sparked by their common subject: the Israelites' flight from Egypt and the crossing of the Red Sea to get to the Promised Land. The expansive nature of this powerful melding will give each section of your SSA chorus an opportunity to stretch and shine. Quoting the Traditional Gaelic melody "Bunessan" (Morning Has Broken) and "Merrial" (Now the Day is Over), Ruth Elaine Schram delivers a rhythmic, pulsing a cappella choral that is engaging and fun. Mixed meters are juxtaposed with homophonic, chorale-style harmonies, and build to a thrilling conclusion. "Listen to the rhythm, the rhythm of life!" Voiced for Mixed choirs with divisi. Free MP3 part-by-part rehearsal aids are available from the publisher. This traditional French carol begins with the proclamation of "Noel" and is followed by elegant unison and 2 part writing. A lilting piano accompaniment supports the voices, and the shimmer of optional bells is sprinkled throughout. A gorgeous selection for the holidays, suitable for church or school use. Accompaniment CD available on the Piano Trax Compilation CD for 2013. The traditional spiritual Little Lamb, Little Lamb, Little Innocent Lamb has been arranged for Unison and Two Part choirs. Easy to learn and to easy to teach, this offering is a great piece to introduce the traditional spiritual style, or just a treat for your singers! The text has been updated by the arranger to make it less confusing for today's choirs. A Little Night Caroling New for SATB! This beautifully and skillfully blended medley of "O Holy Night," "Silent Night," and "All Through the Night" will stir hearts and minds, back to the night when the angels sang and peace was promised to our world. Lush choral harmonies are supported by a lyrical piano accompaniment. Suitable for school or church use. This traditional American folk hymn, while elegantly simple, has been given a fresh, stirring setting by Ruth Elaine Schram. An optional soaring flute obbligato is featured, while gorgeous vocal harmonies convey the image of a spirit who comes in lofty flight to give rest to the weary. The richly flowing accompaniment underscores three modulating verses that gradually lift our souls heavenward. This outstanding spiritual setting was originally published as a male vocal solo in Ruthie's collection "Traveling On" (BLB003). It works beautifully for tenor-bass choir, with a sensitive piano accompaniment, comfortable ranges, and nice teaching moments. The longing quality of the text is so appropriate for guys to sing with an expressive, mellow tone. May be performed by TB or TTB voices. Gorgeous pairing of two beloved Spirituals; "Sometimes I Feel Like a Motherless Child" and "Going Home" (theme from Dvorak's "New World" Symphony). The two combine effortlessly in this lovely, flowing setting. Dreamy, poignant and tasteful, it will touch the hearts of all who hear it. Voiced for Three Part Mixed voices with an optional Baritone part, making it extremely flexible for the developing (or small) choir. Popular German folk song recounts the tale of the lure of the Siren's song and the sailor's fatal shipwreck in this haunting setting for male voices. Lush, romantic harmonies and lovely part writing create a dreamy effect as the story unfolds, and builds to its chilling conclusion. "Be warned, my friend, and heed not the call of the Lorelei!" Delicately arranged from beginning to end, "Lullaby" combines an adaptation of the traditional Welsh "Suo Gan" text with "All Through the Night." Gorgeous accessible vocal lines are supported by a flowing accompaniment, all of which can be enhanced by the use of optional descant. The Flute obbligato adds a crowning touch to this lovely piece. Ruthie Schram has created a charming and versatile setting for children's or treble voices. This gorgeous melding of two beloved carol tunes, "Lullay My Liking" and "The Coventry Carol," features an original text and provides a beautiful Christmas lullaby for treble voices. Artful dynamics rise and fall with the melodic lines, then crescendo to a joyful alleluia. The cello obbligato truly enhances this stunning setting. Available for Two Part or SSA voices; Accompaniment CD available. Suitable for school or church use. A gentle pairing of two beloved Christmas carols, the Polish carol "Infant Holy, Infant Lowly" and the English "Coventry Carol." Together they create a lovely lullaby setting for the celebration of the birth of the Christmas child. This gentle piece will set up a moment of quiet reflection in your Winter Concert. Mary Had a Baby! Amen! With a light swing touch, this selection will have toes tapping and hands clapping. A true celebration of the Christmas birth, this anthem soars to a satisfying and dynamic conclusion. Delightful! Stunning arrangement of the classic African American spiritual is appropriate for school or church use. The SATB version of this expressive setting allows opportunity for a bass soloist (or section) to introduce each verse while the upper voices respond. Supportive, beautiful accompaniment flows downward as "the stars begin to fall." This well-known spiritual comes to new life in this exquisite arrangement by Ruth Elaine Schram. The harmonies are sonorous and warm, beautifully supporting the melody. The syncopation gently propels the work through each phrase, ending softly on "Nobody knows my sorrow." An aesthetic experience awaits your ensemble in this incredible arrangement. Noel Peace Canon New for SAB! A simple statement of the beloved "Dona Nobis Pacem" moves effortlessly to the cherished carol "The First Noel" in this striking choral work for Christmas. The two melodies are woven seamlessly into the musical and textual fabric of the anthem. The result is a cry for peace that is welcome in every December musical gathering: in the concert hall, community gathering, sanctuary, or snow-covered street corner. This inspired work is an absolute must! "O Come, Little Children" is paired with "Angels We Have Heard on High" in this arrangement that is equally appropriate for school or church choirs. An open-fifth motive on "Come, come..." adds an element of mystery and hushed anticipation as the children approach the manger and the angels sing above. This is very sweet for choirs at all levels! Accompaniment CD available. This jaunty arrangement of a traditional English folk song tells the story of a woman who laments being away from her home in the North Country. Lovely harmonic refrains contrast with lyric unison verses, all enhanced by the piano accompaniment and two optional flutes. (Flute parts are included in score.) In minor mode throughout, this is very tasteful and pretty for women's choirs! The beautiful, legato, 13th century plainsong melody arranged by Ruth Elaine Schram may be performed accompanied or a cappella. There is no meter signature for this chant-like work; this among many other elements are teaching opportunities, including developing expression, phrasing, and dynamics. The beautiful, early American folk melody is arranged in a lovely new setting by Ruth Elaine Schram, available in multiple voicings. Expressive arrangement gives conductors teaching opportunities with freedom of interpretation. This gorgeous arrangement for ladies voices by Ruth Elaine Schram is characterized by beautiful harmonies and warm musical lines. It is sensitive, expressive, and stirring -- all the things that make up an aesthetic experience for your group. Cleverly combining two Christmas favorites, this tender anthem provides the opportunity for a soloist or small ensemble to open with the melody to "Once in Royal David's City." This transitions seamlessly into "O Little Town of Bethlehem." The optional cello accompaniment helps to set a mood of peace and joy for your Winter concert. Also suitable for combined choirs as a tremendous addition to your program! Ruth Elaine Schram's wonderfully creative arrangement exudes a wistful, fresh take on this Scottish folk song favorite and features the Robert Louis Stevenson text. The violin part (included in score) provides a welcome texture and color to this concert showpiece. Historical background information and suggestions for further study are also included. Performance / Accompaniment CD available. Original and traditional songs in combination for teaching part singing for elementary age children. This fast-paced, energetic and joyful pairing of "Pat-a-Pan" and "Sing We Now of Christmas" is enhanced by both flute and percussion. Available in five voicings to meet the needs of most any ensemble, this dynamic arrangement will create a high point in your Christmas / Winter concert! Parts for Hand Drum and Flute are included in score. Traditional African-American Spiritual is set for unison or two part voices with flowing piano accompaniment. Expressive arrangement begins in 4/4, then goes into 3/4 as the text changes to "love is flowing," then back into an energetic 4/4 section for "joy like a fountain," then ends up as it began. Suitable for church or school use. "On this day earth shall ring with the song children sing. To the child born a King, sing we alleluia!" This well-known 16th century carol text and melody is embellished in this creative setting. Alternating between Latin and English text, with piano accompaniment and optional 3-octave handbells, this sparkling arrangement is perfect as a processional or from the concert stage at your Winter Concert. A learning resource page for application of this piece to the teaching standards is included. This arrangement of a lovely French carol may be performed in French or English. With canonic-like imitation throughout, this is a sensitive, haunting, beautiful carol, a programming must for holiday concerts. Flexibly voiced for Two-part Mixed / Optional 3-part Mixed voices (Part II in the treble clef is optional throughout) with piano accompaniment, this is a wonderful selection for developing mixed ensembles. The beautiful folk melody is sensitively set for SSA voices in this charming arrangement. Delicate harmonies come easily to the lower voices as the melody floats effortlessly above. "Bow down your head and cry, poor boy ... and stop thinking of the one you love ..."
This swingin' arrangement of "I've Been Workin' On the Railroad" by Ruth Elaine Schram offers program notes by the arranger inside the front cover, which include background information on this folk medley as well as some rehearsal tips and performance suggestions. With a couple of speech riffs and a little jazz flavor, this delightfully fresh presentation of this work will make a fun folk-novelty feature for any concert. Available for mixed choirs (includes some optional cues for divisi in the ladies) or men's voices. Lush harmonies set a mournful mood for this creative partnering of the American folk songs "Red River Valley" and "Down in the Valley." The two tunes meld unexpectedly in the last verse, the use of echo fortifies the "valley" theme, and dynamic contrast supports the poignancy of the lovelorn text. Available for SATB or SSAB voices. Melodic and singable, with delightful harmonies, this setting of the Welsh folk song has a bright, lilting feel. It's a great piece for teaching the musical line, and the ranges are very appropriate for young singers. Fun, singable arrangement of the folk song for young TB choirs is short and sweet! "Want to ride it? Go like you're a-flyin'? Buy your ticket at the station on the Rock Island Line!" Cute, light arrangement of the Traditional folk song arranged for SAB voices with optional percussion instruments. Lots of teaching opportunities with changing meters, styles, and tempos, but lots of fun to sing (and play!). Suitable for church or school use. Accompaniment cassette available; percussion parts included. Commissioned by the All-Cleveland County (North Carolina) Middle School Choral Festival. Pure fun abounds in this unison/optional two-part original folk song by Mark Cabaniss, arranged by Ruth Elaine Schram. Your choir will enjoy singing about the folks from Rockwood River, where life is easy and the pace is slow. The optional fiddle and string bass parts, enhanced with intermittent clapping, add a realistic musical depiction of a Huck Finn / Tom Sawyer adventure. Available in two voicings. Stunning, transportive anthem that lyrically weaves together the traditional "Lo, How a Rose E'er Blooming" and "What Child Is This?" to create an unforgettable work for your winter concert. Festive Partner-song arrangement of the Swedish carol "Yuletide is Here Again" and the Danish carol "A Child is Born in Bethlehem" is a nice, joyful change of pace for your holiday concert. Set in bright triple meter, the two songs are introduced individually then combine effortlessly to celebrate the season. Ruthie Schram has created a wonderful arrangement that captures the very essence of the well-known classic spiritual. Optionally a cappella throughout, with optional solo phrases, exciting dynamics and a joyful rhythmic feel. Singable voice parts, featuring movement in the bass line, make it entertaining and fun for your choir and audience. Sure to be a winner! Shalom, Pacem, Peace New for Two Part! Based upon the haunting "By the Waters of Babylon" folk tune, this gorgeous, poignant setting is a call for peace in three languages: Hebrew, Latin, and English. Set as a round, it will work for any combination of voices and will be easily learned by any age group. Optional instrumental parts for Cello and Two Violins (or Flute and Oboe) add depth and beauty to the flowing accompaniment in this piece that is equally effective for school and church. A delightful pairing of "Shepherds! Shake Off Your Drowsy Sleep" and "Sing We Now of Christmas" comprise this holiday feature for young male voices. Use the optional tambourine part included in the score to add a festive flavor to this joyful mini-medley! Ruthie Schram's dynamic setting of this eighteenth-century Irish folk song is the perfect creative programming choice for your treble choirs. A mixture of thoughtful rubato and energetic rhythms, a Gaelic chorus--written phonetically throughout--and an optional violin obbligato all contribute to the lively Celtic flavor and flair. Perfect for Concert or Festival Use. Ruth Elaine Schram has created an arrangement of extraordinary beauty of the beloved carol . A lush piano accompaniment and cello part add the crowning touches to this wonderful carol setting which is equally appropriate for both school and church use. Cello part included in score; Performance / Accompaniment CD available. The 18th century Shaker hymn tune has been artfully arranged by Ruth Elaine Schram for multiple voicings. Use of unison and echo singing, in conjunction with beautiful harmonies make this piece easy to learn but lush to the ear. Optional flute part is included in the score. Equally suitable for church or school use. 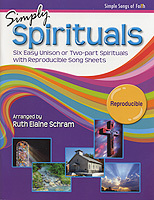 Six easy Unison or Two part Spirituals with reproducible song sheets, arranged by Ruth Elaine Schram. The beloved carol by G. F. Handel, set for three part treble voices, is creatively and attractively paired with "Spring" from "The Four Seasons" by Vivaldi in the accompaniment, resulting in a delightful turn of two classics that everyone is guaranteed to enjoy. Equally appropriate for school or church. This fun, upbeat pairing of two African folk songs (from Ruthie's collection, "It's Christmas Everywhere") is a dynamite choice for your winter concert. Optional sacred lyrics are included, making this perfectly suitable for school or church use. Employing a variety of percussion adds to the fun, and specific suggestions and ideas for use are provided. For mixed or treble voices; delightful accompaniment CD orchestrated by Greg Gilpin. Three-part Mixed / SAB version works with E - C range or F - D range for guys. This one will keep everyone on their toes! Delightful, creative medley of "Here We Come A-Caroling," "Sing We Now of Christmas," "Deck the Hall," and "Jingle Bells," all woven together seamlessly with plenty of unison writing to make it easy to put together in limited rehearsal time. Cleverly and tastefully done, utilizing moderate ranges for the high school or community musician, this is a healthy dose of holiday fun! Based upon a relatively unknown carol by John B. Dykes, this lovely arrangement incorporates portions of the beloved "Still, Still, Still," which is always a favorite at Christmas time. This sensitive and accessible setting by Ruth Elaine Schram with its unexpected chord structure will be warmly received in either a school or church setting, and is perfectly suitable for a Winter Concert or Christmas Eve service. With limited range SATB voicing (perfect for developing choirs or choirs with limited range abilities), Sleep Holy Babe is accompanied by piano with optional flute and glockenspiel. Ruth Elaine Schram imparts a message of comfort and hope with this partner song pairing "Somebody Bigger than You and I" by Johnny Lange, Hy Heath, and Sonny Burke, with the familiar tune "He's Got the Whole World in His Hands." The result is a powerful song that will be popular with both your singers and listeners. Optional a cappella beginning sets the tone for this classy setting. Terrific, upbeat arrangement of the lesser-known Spiritual for male choir. The music is so much fun, you may not even realize the import of the message: "We can all get lost in the storms of life!" Works for Two Part or Three Part male voices. Fun, delightful arrangement of the Appalachian folk song is available in multiple voicings. Cues for foot stomps and hand claps are included. Vibrant and upbeat, a real crowd-pleaser! The Spirit Says Sing! New! Developing choirs will love this fun medley of two traditional spirituals, "I'm Gonna Sing" and "Every Time I Feel the Spirit." Rhythmic and upbeat, the supportive accompaniment punctuates the rhythms while adding color and texture. The optional Descant provides an added opportunity for either a soloist or small group, and seamlessly ties the two tunes together. A valuable Learning Resource Page is included as an added bonus. Beautiful and sensitive setting of the well-known spiritual is suitable for church or school use. The musical imagery is exquisite with great expressive potential and lots of teaching opportunities. The limited range in the SATB version is perfect for the developing ensemble capable of four part harmony. Ruthie Schram's arrangement of this traditional ballad opens with a solo voice describing the scene in this Texas town. When the rest of the TBB chorus joins in, they benefit from the full, rich part writing. A great selection for the male chorus! The gorgeous lullaby that has been heard in several commercials has been arranged for young voices, and will be a lovely addition to your holiday concert or festival repertoire. Available in Three Part Mixed and Two Part voicings. Suitable for school or church use. Now available in the new "Children of the World" book from Alfred. Exquisite setting of the lovely Newfoundland folk song tenderly expresses the mourning and sense of loss evident in this piece. The soaring melody and sonorous harmonies are wonderfully supported by a moving accompaniment. Soulful arrangement of the African American Spiritual by Ruth Elaine Schram includes a mixture of up-beat swing eighths and a change of feel to lush, even eighths. Suitable for school or church use, with optional solo (which may be performed by unison choir). In "That Promised Land," Ruth Elaine Schram has paired two traditional spirituals - "Walk Together, Children," and "When the Saints Go Marching In," and the result is a pure delight. After each song is first stated alone, they are cleverly partnered in a way that makes this arrangement both easy-to-learn and fun for any combination of two-part voices and choirs of all ages. Delightful accompaniment track (orchestrated by Tim Hayden) makes this tune sparkle! Suitable for school or church use. Rich, full arrangement of the English folk song will showcase ladies' voices. With its warm harmonies, this gem of beauty and sensitivity is a powerful statement of love and love lost, strength and tenderness. Overflowing with opportunities for expressiveness! This light, jazzy "swing" arrangement of the folk song is perfect for general use in school or church. Guitar, Bass, and drum parts are included, and an accompaniment track is available. Moderate ranges are suitable for any age choir. In this combination of two familiar and beloved spirituals, Ruth Elaine Schram has crafted a thoughtful and captivating medley suitable for both school and church use. Gorgeous chords permeate the vocals and piano accompaniment, both of which are further strengthened by an optional cello obbligato which is included in the score. Beautiful, creative arrangement of the lovely Scottish folk song "Waly, Waly." Available in multiple voicings with gorgeous piano accompaniment. The beloved folk song is given fresh treatment in this new arrangement by Ruth Elaine Schram. An optional text by Robert Louis Stevenson adds even more flexibility to the beautiful melody. Refreshing and alive, this wonderful gem will provide your singers with an aesthetic experience that is easy to learn and express. Based on an Arapaho folk tune, this enchanting piece from the talented pen of Ruth Elaine Schram celebrates the beauty of nature and the circularity of life. An optional flute obbligato adds the crowning touch to this evocative work full of mysterious melodies and thoughtful harmonies. The familiar traditional carols, "Deck the Hall," "O Tannenbaum," and "The Wassail Song" are joined with some original words and music in this clever partner-song setting. "Welcome, December, the holidays are near. So, we welcome December, the best time of the year..." Pure delight for your winter programming! Ruth Elaine Schram's arrangement of the gorgeous carol is exquisite for ladies' voices and suitable for church or school use. "...In Bethlehem, upon that morn, there was a babe so wondrous, born..."
The gorgeous Irish carol has been paired with the familiar "Venite adoremus Dominum" chorus from "The Snow Lay on the Ground" to create a lovely Christmas offering for treble voices. Optional flute and cello parts add a crowning touch to this exquisite selection that is suitable for school and church settings. This gorgeous setting of the beloved carol is a most-welcome addition to treble choral literature. By featuring two clarinets, Ruthie has created a hauntingly beautiful and unique Middle Eastern aura. Optional lyrics are included to make it equally suitable for school or church use. A fresh paring of two beloved American Folk Songs ("Shenandoah" with "The Water is Wide") will offer a moment of peaceful reflection at your concert or festival. The fluid accompaniment ties the two songs together, both culturally and geographically, with a flowing texture that represents the movement of the water. A helpful Learning Resource Page is included in order to tie the piece to the National Standards and present cross-curricular opportunities. In this gentle Ruth Elaine Schram setting of a lovely Kenyan folk song, triadic harmonies in the voices are sometimes close and other times open to create breathtaking treble sonorities. "...Star shine falling, brighter than day; shepherds calling, joyful are they. Tucked among the cattle and sheep, no wonder baby won't sleep!" Suitable for school or church use.